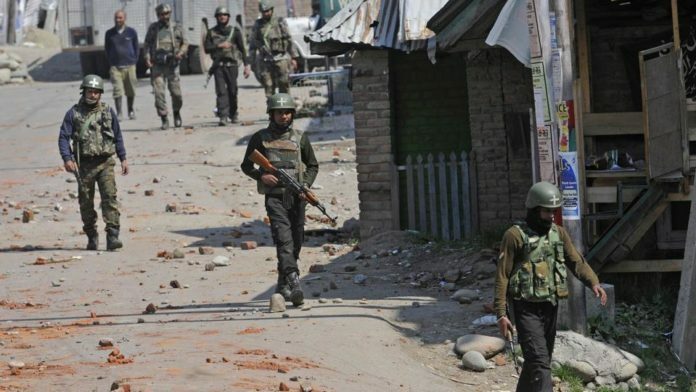 Srinagar: At least 10 youth were injured in clashes with government forces near a site of gunfight in Gadapora village of south Kashmir’s Shopian district on Friday. The injured youth were shifted to district hospital Shopian for treatment. Doctors at district hospital Shopian said that one youth with fire arm injury in neck and two with pellet injuries in eyes were referred to SMHS Srinagar for advanced treatment. The remaining injured were being treated at district hospital Shopian. Reports of clashes were also received from main town Pulwama and Newa area. Earlier, clashes erupt Between youth and forces near gunfight site at Gadapora. Two militants were also believed to have been killed in the gunfight. However, their bodies were yet to be recovered from the site of the gunfight. Previous articleIndia one of world’s fastest-growing large economies: IMF. Next articleSecurity forces kill seven terrorists in J&K.